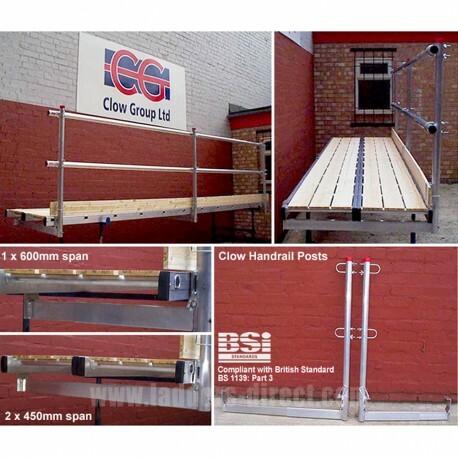 Versatile, cost-effective and easy to assemble, the standard Clow Adjustable Handrail Posts are suitable for use with any width of staging up to a maximum width of 600 mm. The Adjustable Handrail Post is also available with an extension section allowing it to be adapted to fit 2 x 450 mm stagings. Please contact us for more information on this option. Clow Adjustable Handrail Posts comply with the requirements of former BS1139: Part 3 and can accomodate a double handrail. When estimating your requirements for the handrail we recommend a maximum of distance of 1.5m between the vertical handrail posts.